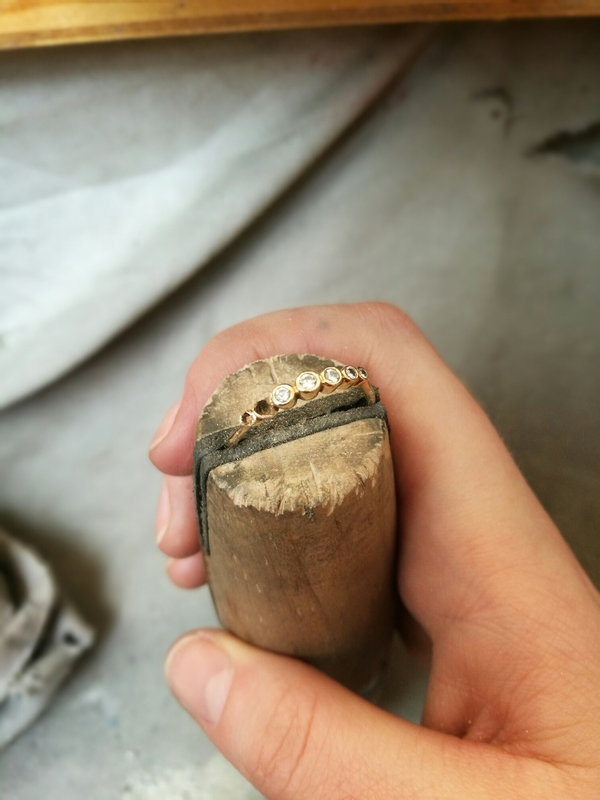 As jewellery has such a strong sentimental value, it’s possible to take on commissions where your old piece(s) of gold jewellery can be revamped and made into something new. However some people are often shocked at how much this would cost. So I have written this blog post to explain why. 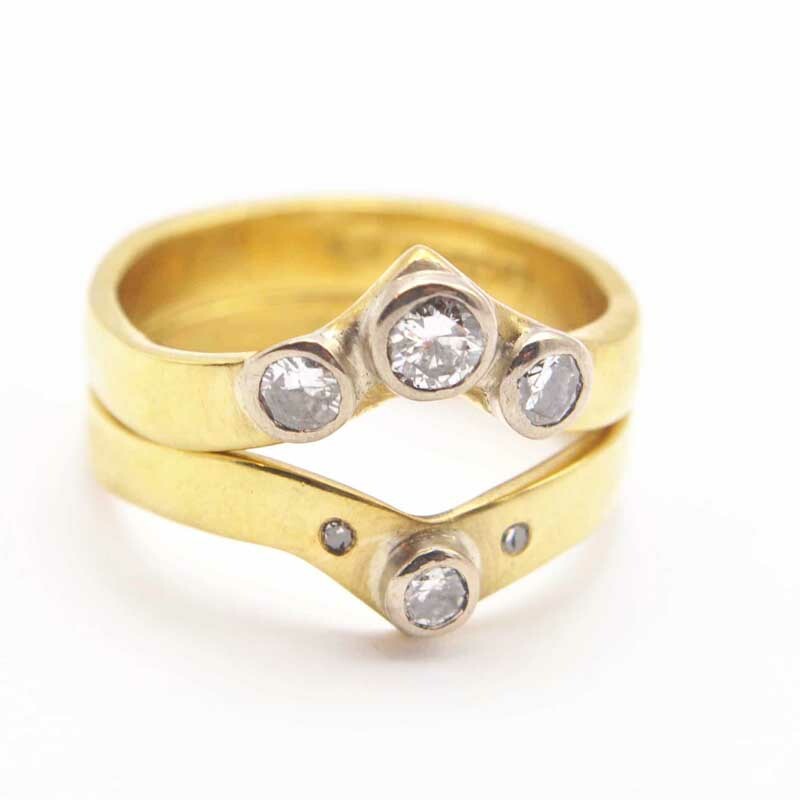 What is involved when making a revamped piece of jewellery? When a designer takes on a normal commission, starting from scratch with new materials, we normally buy in materials that are the correct size and shape for that particular commission. For example, we buy the right width of wire to make the ring band, the correct size of stones and the materials to make the settings, etc. However, when the client comes in and wants a new piece made from their old sentimental pieces of jewellery, they assume that because they are providing the materials that it won’t cost very much to make. Unfortunately this is not the case as the making process is very different when the commission is a revamp. This is due to the time it takes to melt down and reform their gold before it can be made into an actual piece of jewellery. 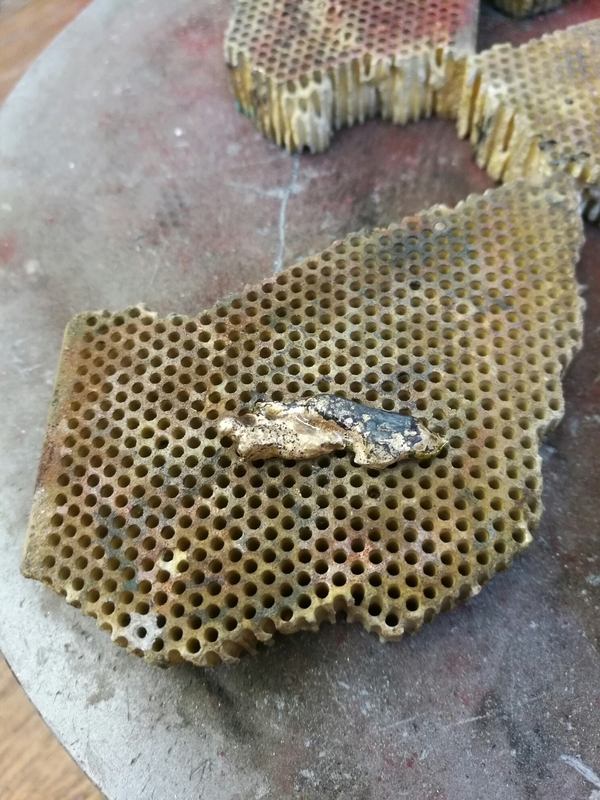 Process in short – taking out the stones, cutting off the solder, cutting off the settings (if white gold and other unusable sections), deep cleaning all usable materials, melting the gold, reforming the metal so that it can be fabricated/shaped into the new piece. Then the making process can begin. Not only is the prepping process time consuming, there are a lot of risks. The stones could crack when taking them out the settings. 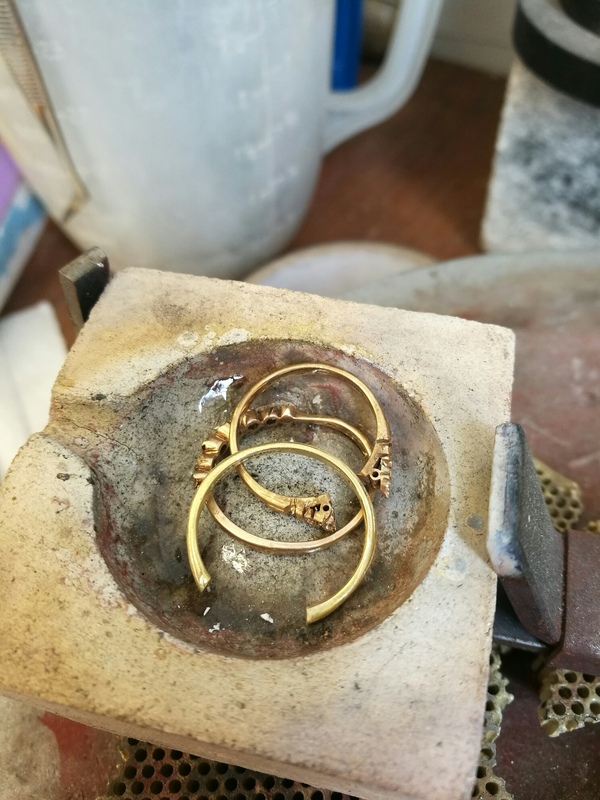 The clients jewellery could be years old, which means the gold may have different metal properties than today’s standards. It will be different thicknesses, could be varying carets/colours of gold and things can start to get complicated. For example a client could give me two 9ct gold rings and an 18ct gold ring. The carets of gold are different colours and have different melting points. 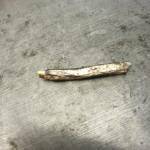 9ct can become very brittle when remelting and can cause a lot of issues, like cracking when forming and shaping the metal. If there is not enough gold then extra gold would need to be purchased and added. 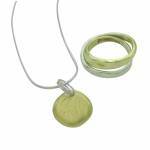 If mixing metals, the piece will only be hallmarked at the lesser value metal. 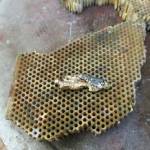 So if 9ct and 18ct is melted together it will be hallmarked as 9ct gold. Also if you mix red (rose) gold and yellow gold together, it will change the colour of the gold and there may be areas that are more red than others. This is what happened when making this piece. There is a subtle line of rose gold through the bottom of the right hand side of the band. I always tell my clients that going ahead with the revamp commission is at the customers own risk. The melting process may not work due to all these points that I’ve mentioned above. The gold may have to be scrapped and new gold may have to be purchased if they wish the commission to be completed. But either way it’s still use of my time so I have to charge for the prep and melting process time. This is why my revamping service starts at £500. This does not include any extra gold or stones that need to be purchased. I have silver, can you revamp it into something new? I’ve changed my mind about the design, can we change the shape? Once you have agreed on a design, the deposit has been paid and I have begun making the piece, it will be very difficult to change the design. If you do decide to change the design part way through, the cost will increase. In most cases I will not accept a design change if it’s totally different to the original design. I will have already melted the gold to the shape needed to make it into the original design. So if the design changes I would have to go back to the start and re-melt the gold which would most definitely cause the gold to became brittle and crack. This will obviously take more of my time so I would have to charge extra for change of design. Due to the process explained above, it is very difficult to estimate how long a revamp will take to make because of the various risks stated above. 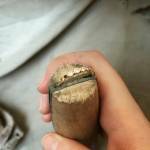 Sometimes the gold isn’t usable as it’s too brittle and cracks, it would need to be scrapped, new gold will need to be purchased and I would have to start again. But all my time was spent melting the gold and getting the commission to this stage, so therefore I still need to charge for my time spent on this. I won’t know how long it’s going to take as there may be complications. I normally say revamps can take between 4-8 weeks, sometimes longer, sometimes shorter. Revamps start from £500, depending on their complexity and risks stated above. I always ask clients what their budget is to begin with and I tend not to go over it. If the commission is going to cost a lot more than they’ve budgeted I tell them before going ahead if anything changes during the process of making. The Scottish Artists Union (2016-2017) hourly rate states, that I should be charging £32.03 per hr or a Day rate of £266. I always underestimate how long it takes to do a revamp commission. At a minimum, making time for a revamp melt down commission can be 3 days. Most of the time, it doesn’t go smoothly and it takes much longer to make than expected. I always ask clients what their budget is to begin with and I tend not to go over it. Sometimes the gold isn’t usable as it’s too brittle and cracks, so new gold will need to be purchased. Sometimes the customer doesn’t provide enough gold, so more materials have to be ordered. Sometimes stones crack, so you will be charged if I need to purchase more stones. Sometimes I can’t get the appropriate setting for your design, so the setting needs to be handmade from scratch which will obviously increase the price and my time. So at least when I say it’s £500 to start with, you know that the cost may increase due to all the issues mentioned above. I’m not trying to rip anyone off, I just want to be paid a reasonable rate for my time as a professional designer. I know that some jewellers don’t even take on melt down revamps as they are so time consuming and risky to make but some of the ones who do, charge £900 or more for their starting point. Can I provide some of the materials and you source the rest? Yes I have carried out many revamp commissions where customers only had a little amount of gold. 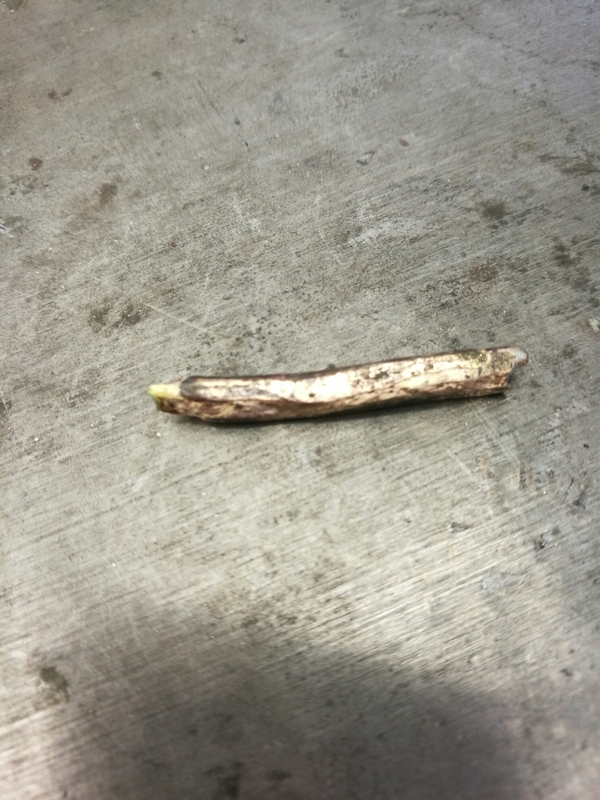 Some customers had yellow gold but wanted a white gold piece made. Some customers didn’t have stones so I sourced some for them. You might just have the stones but no metal. This is also possible. Below are some examples of revamp commissions that I’ve made. 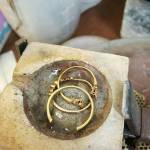 In some cases I don’t need to melt down your gold and can use it as it is with a few tweaks! 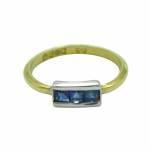 The 3 sapphire ring was made using my clients original ring band and I handmade a white gold setting. The pendant and twist ring were made from my clients two rings. The original ring band from the two rings were soldered together and silver was added to create this twist ring. The chunky part of the signet ring was used to make the pendant. Chunky cluster ring on the left was made using the customers own diamonds which I took out of her original ring. I provided the rest of the materials. 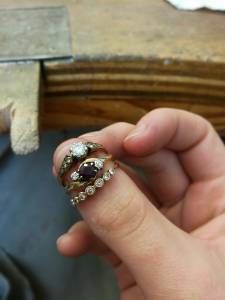 The rings on the right were made from melting down my customers own gold ingot and took the diamonds out of their rings. If you would like to know more or are interested in getting a piece revamped just get in touch. Fill in the consultation form and remember prices start from £500.